I forgot how much reentry into the real world take out of you! I had to wake the kids up this morning (unheard of from Scorch), leave a sobbing kid in the arms of their teacher, deal with 500+ emails at work, do 8 loads of laundry, get our taxes signed and get the snacks together for the kid’s Leader Day at school tomorrow. In short, I’m fried. But I have been working on mental list of all the things I learned after living through a 2400+ plus mile road trip with my kids and going to Disney World for 3 days. It’s not exactly riveting reading material, but I hope it helps someone! 1) I hear about a lot of families who leave for long road trips at the kids bedtime and drive through the night while their kids sleep. Sounds great in theory, but that would never work for us. First, the Hubs and I need our sleep and we’re miserable people without it. Second, the Bean doesn’t sleep in the car. She never has even as an infant- so trying to force her to as someone (*cough*TheHubs*cough*) tried on that first day was an epic failure. In fact, the only meltdown we had on the trip was when the Hubs wanted to drive further an hour past the kids bedtime instead of settling in at a hotel. The Lesson: know your kids schedule/ability and stick to that. It’ll make life more pleasant for everyone. 2) I stocked our car with all sorts of fun things for when we traveled. New coloring books, markers, games, etc. Sadly, what worked best were the DVD players. Yes- plural. We have one overhead DVD player in the car and that’s perfect for 99% of the trips we take. But when you’re logging 12 hour days in the car, it was much nicer to be able to give them their own DVD player (that we borrowed!) and headphones and let them zone out that way. We avoided a lot of arguing and tears that way. The Lesson: never underestimate the power of technology. 3) The Hubs is the type of guy who likes to drive until he is either on the very last fume in the gas tank or until his bladder is going to burst. Frequent stops aren’t in his DNA. But with the kids we found ourselves stopping every 2-3 hours for a bathroom break. During those breaks we raced around the rest areas, played tag or did a quick kiddy bootcamp to work some of the crazies out. We also made sure to stop for at least 1 sit down meal a day. Even if it was Denny’s, it was a welcome break from the car and all the crappy food we were consuming on the go. The Lesson: stop and stop often, especially if your kids don’t nap anymore but are still young enough to scream the car down. 1) We don’t own a stroller anymore- in fact, I can’t tell you the last time we used one. The Bean may have sat in one all of a dozen times her whole life. But when you’re in Disney, that doesn’t matter. Either bring your own stroller or pony up the money ($31 for a double stroller for a day) for one- it’ll be the best money you spend. Disney is crazy busy with literally tens of thousands of people walking everywhere. Many attractions are far away from each other and you’re hiking all over trying to see them all. Having the kids strapped in not only kept my kids safe, but it also made sure they weren’t exhausted, overtired crankpots 3 hours into the day. The Lesson: the stroller is God at Disney. The Lesson: your kid can only handle what they can handle. Trying to force them to have fun or try something that terrifies them will not end well. 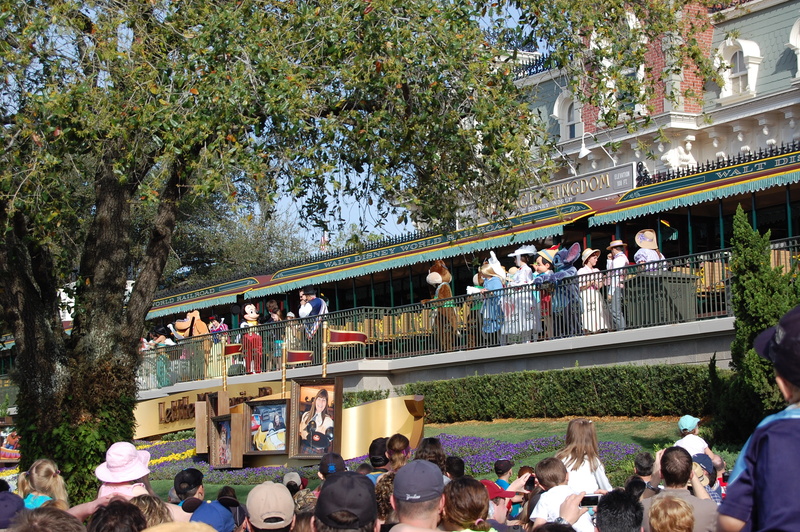 3) When we were at the Magic Kingdom, we bought lunch on our first day. We got 2 adult meals (burger & fries), 1 hamburger kids meal and 1 PB&J kids meal. It cost us $53. Disney lets you bring in food to the park, but we thought bringing in a cooler or snacks would be too difficult, so we didn’t. Honestly, the food would have been better if we did and we would have saved a bundle. 4) We were lucky enough to have my parents with us our whole time in FL and while we were in Disney, the Hubs uncle and cousin joined us for some of the time. A 6 – 2 adults to kids ratio sounds like over kill, but it was perfect! There was always someone who could watch the kids while the adults did a scarier ride and it allowed the Hubs and I to be able to enjoy this vacation a lot more. The Lesson: travel in packs. 5) When we first got to the Magic Kingdom, our tour guide (The Hub’s uncle) ushered us to the back of the park to hit the Peter Pan ride. Why? 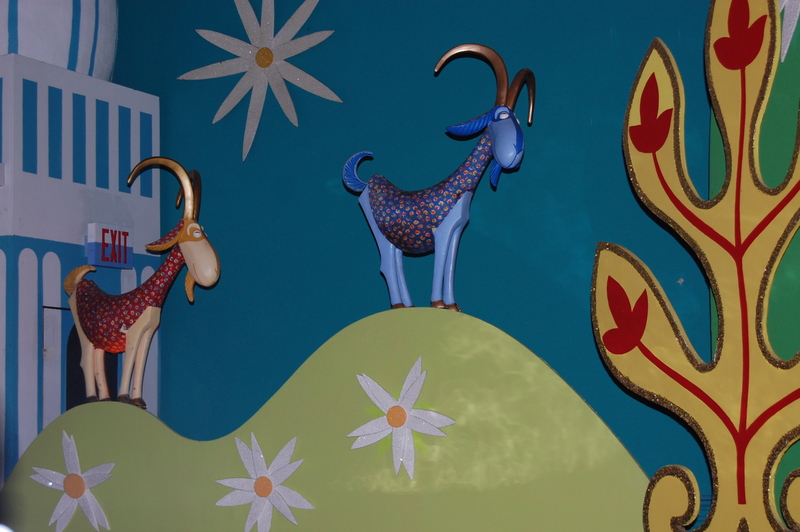 It’s the most popular one in the Magic Kingdom. If I took nothing else away from this trip, it’s 1) hit the most popular rides first (our wait time was 10 minutes- within 1 hours of opening, it was a 50 minute wait) and 2) use your fast pass! Fast pass allows you to reserve your spot in a ride- you check in and are told what time to come back. When you do, you’re usually on the ride within 5 minutes, totally bypassing the line. So worth it. The Lesson: hit up the popular rides first and don’t forget to use the Fast Pass. 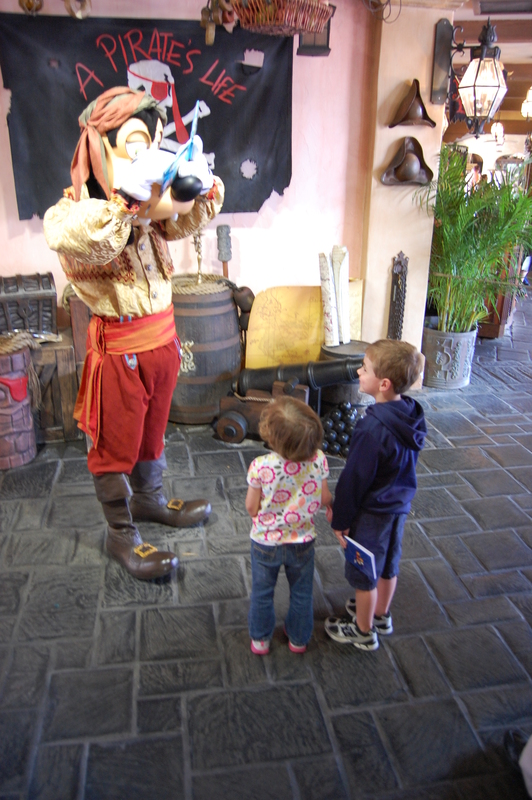 6) Out of all the things we did while at Disney World, the thing my kids liked the most was meeting the characters. 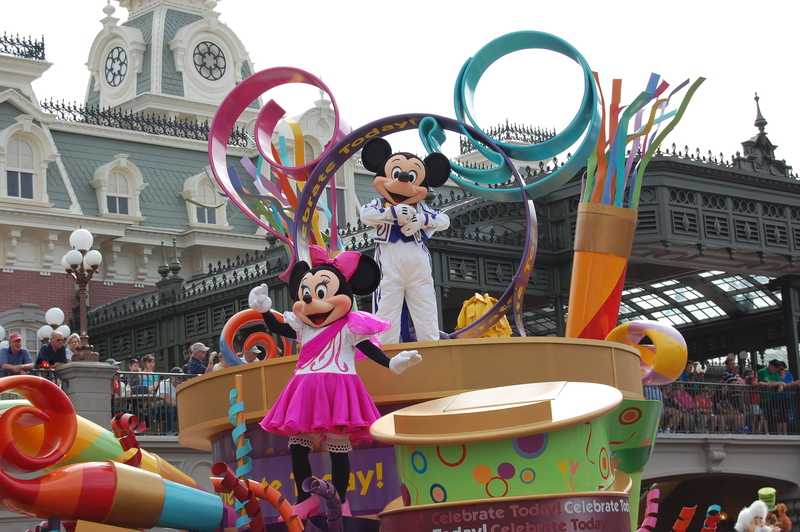 We met Donald, Goofy, Pluto, Belle, Princess Aurora, Cinderella, Woody, Jessie, Micky, Minnie and a few others I can’t remember. Yes, it was a pain in the rear standing in line to meet them, but so so so worth it! I bought the kids autograph books and special pens that they kept with them for just this purpose- those encounters were the highlight of the trips for my kids. A little tip- when in the Magic Kingdom, go to the Town Square Theater- there you can stand in line to meet the princesses or to meet Micky & Minnie. The meet and greet with Micky is called “Backstage at Mickey’s Magic Show”- so we didn’t have a clue we could actually meet The Mouse there. Evidently no one else did either because we were in line less then 5 minute before the kids met him and Minnie- easily the shortest line of the day! The Lesson: Get (or make) an autograph book and soak in the looks on your kids faces when they finally meet some of their favorites!